Strabismus is a condition in which the eyes do not align in the same direction. It is also called crossed eyes or squint. With normal vision, both eyes focus on the same spot and send the brain the same message. This binocular fixation (both eyes looking directly at the same object) is necessary to see three-dimensionally and to aid in depth perception. When an eye is misaligned, the brain receives two different images. Young children learn to ignore distorted messages from a misaligned eye, but adults with strabismus often develop double vision (diplopia). A baby's eyes should be straight and parallel by three or four months of age. A child who develops strabismus after the age of eight or nine years is said to have adult-onset strabismus. Esotropia is the most common type of strabismus. It occurs when the eyes turn inward. Infantile esotropia develops in children under the age of six months. 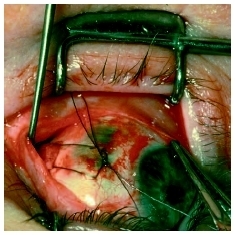 A close-up of ophthalmic surgery being performed to correct strabismus. Accommodative esotropia develops in children under age three who cross their eyes when focusing on objects nearby. This usually occurs in children who are moderately to highly farsighted (hyperopic). Congenital esotropia is a very rare form of strabismus that occurs with certain birth defects. Another common form of strabismus is exotropia, sometimes called walleye, where the eyes turn outward. It may only be noticeable when a child looks at distant objects, daydreams, or is tired or sick. Other strabismus conditions include hypertrophia, where the eyes turn upward, and hypotropia, where the eyes turn downward. With strabismus, in some cases the eye turn occurs always in the same eye; however, sometimes the turn alternates from one eye to the other. Most children with strabismus have comitant strabismus, which means that no matter where they look, the degree of deviation does not change. In incomitant strabismus, the amount of misalignment depends upon which direction the eyes are pointed. Illustration of patient with strabismus, before and after corrective surgery. 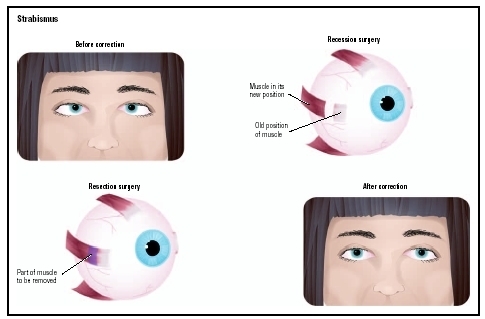 During the surgery, the eye muscle may be lengthened (recession surgery) or shortened (resection surgery). False strabismus usually disappears as the child's face grows. An eye doctor (ophthalmologist) needs to determine whether the eye turn is true strabismus or pseudostrabismus. Strabismus affects 5 percent of people in the United States or more than 12 million individuals, most of them children. Infantile esotropia affects about 1 percent of full term, healthy babies and a higher percentage of babies born prematurely or born with other facial defects. Congenital esotropia is rare but does not occur at a higher rate in premature babies. Strabismus occurs equally in boys and girls and shows no variation in racial or ethnic distribution. Most strabismus develops in young children, although a few diseases may cause it to develop in adults. The most obvious symptom of strabismus is an eye that is not always straight. The deviation can vary from day to day or during the day. People who have strabismus often squint in bright sunlight or tilt their heads to focus their eyes. Parents should call their doctor whenever they notice their child's eyes appear misaligned, even if the child is very young. A baby whose eyes have not straightened by the age of four months should be examined to rule out serious disease. Strabismus is not a condition that a child will outgrow without medical intervention. Pediatricians can refer parents to an ophthalmologist (eye specialist) skilled in evaluating the vision of very young children. Every baby's eyes should be examined by the age of nine months. A pediatrician, family doctor, ophthalmologist, or optometrist licensed to use diagnostic drugs uses drops that dilate the pupils and temporarily paralyze eye-focusing muscles to evaluate visual status and ocular health. Early diagnosis is important. Some eye turns may result from a tumor. Untreated strabismus can damage vision and possibly result in lazy eye ( amblyopia ). Early consistent treatment usually improves vision and appearance. The most satisfactory results are achieved if the condition is corrected as early as possible and before the age of seven. Strabismus cannot be prevented, but it can be corrected with early intervention. Parents are often concerned that eye turn is indicative of other vision problems. Sometimes strabismus does accompany other vision defects, so a complete eye examination by a pediatric ophthalmologist is advisable. Delay only increases the difficulty in correcting strabismus, so parents should not wait to see if their child outgrows the condition. Ophthalmologist —A physician who specializes in the anatomy and physiology of the eyes and in the diagnosis and treatment of eye diseases and disorders. Plager, David, et al. Strabismus Surgery: Basic and Advanced Strategies. Oxford, UK: Oxford University Press, 2004. American Academy of Ophthalmology. PO Box 7424, 655 Beach Street, San Francisco, CA 94120–7424. Web site: http://www.aao.org. American Academy of Optometry. 6110 Executive Boulevard, Suite 506, Rockville, MD 20852. Web site: http://www.aaopt.org. American Academy of Pediatric Ophthalmology and Strabismus (AAPOS). PO Box 193832 San Francisco, CA 94119. Web site: http://www.med-aapos.bu.edu. Cooper, Jeffrey. "All about Strabismus." Optometrist Network , 2001. Available online at http://www.strabismus.org (accessed October 31, 2004). Gerontis, Corina C. "Exotropia, Congenital." Available online at http://www.emedicine.com/oph/topic330.htm (accessed October 31, 2004). Ocampo, Vincente V., and C. Stephen Foster. "Exotropia, Infantile." Available online at http://www.emedicine.com/oph/topic328.htm (accessed October 31, 2004). Stidham, D. Brian, and Chris Noyes. "Exotropia, Accommodative." Available online at http://www.emedicine.com/oph/topic330.htm (accessed October 31, 2004). I found this site extremely helpful. My comment is: I'd like to read about how you would know whethter your child had the stabismus from lax muscles or from a damaged brain signal from the area of the brain that sends these signals. My son has surgery for his strabismus (he had other neurological disorders) but my 14 month old daughter is exhibiting stabismus as well although she is presenting as a typical infant. So I'm wondering how you tell the diffence. Our surgeon told us that strabismus is genetic in orgin. This is very interesting, thank you. I am 25 and have suffered with this condition for my whole life, I have never had any treatment and would just like to say that if your baby/child has this condition make sure you get it looked into and have any treatment available because it is horrible to live with. Children at school were cruel and now that I am older I am very paranoid because if I turn in a certain direction my left eye goes in, its horrible! I am now thinking of having my own children I worry about them having the same condition.